What’s this i hear you cry…. well, if you take the land between Lubbock, Alpine and Albuquerque in New Mexico (which forms a triangle), this covers canyon and desert terrain. This area also has probably 6 of the most important UFO events; and it is also, not to far from Stephenville, to the East. Within this area, we have the 1947 Roswell incident, a whole series of car stoppages near Levelland, Texas (1957- see here and here for more details), and a police officer in 1964, who witnessed an object land with entities, in New Mexico at Socorro (see here for details). The amount of UFO occurrances between 1947-1952 in this area, meant the government expressed grave concern, as too what was going on. However, alot of scientific research is/was done in this area (early atomic bomb-tests and missile sites for example are all here). Dr Lincoln La Paz (meteor expert- see here for more), spent many a year, researching green fireballs, that behaved unlike meteors- these incidents happened frquently in the 1940’s-1950’s. 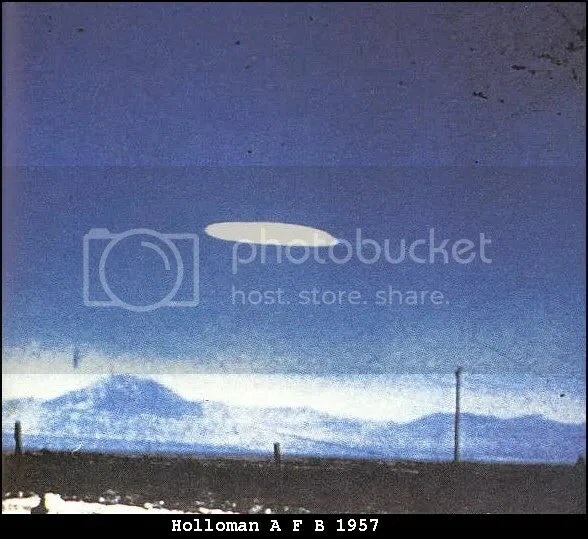 Photo (above) taken around 1.30pm (16th october,1957) whilst driving on Highway 54 (south of Alamogordo, New Mexico); photo taken by Ella Fortune. It was near the Holloman Air Force Base, and close to the site of the first atomic explosion (in 1945). There is much debate as to what this is…. some say it is a lenticular cloud (although this is disputed, due to the fact, that it reflects too much light to be a cloud), others a balloon; however, as far as i’m aware, its origin has not been established. The UFO was hovering motionless. Several days later, near Levelland, a whole series of sightings took place….there were car stoppages (2nd and 3rd november 1957), also similar occurrances around Sacramento Mountains. At Orogrande, an engineer, at 1pm on 4th november (1957), lost engine/radio/lights response on his car….this happened to others on the same road, as an oval shaped UFO, was seen. However, the engineer, also endured waves of heat…..later that day, alot of his body became red/itchy. 7th november (1957), not far from above (ie in the vacinity), 2 people in their car at 9.20am, saw a UFO, and immediately the speedometer was affected. In 1951 (august 31st), at Lubbock, there was a photo taken of a V-shaped formation of lights. However, we now know these ‘lights’ were in fact birds (see here for more details)! In 1952, the lights returned, and a professor, Dr Ducker, went to great lenghts to establish that they were birds, with a whole series of experiments. However, he also came to the conclusion, that not all were birds, and some were unknown. This is just a taster, of the many UFOand IFO activities within/around this area….. also now, with the Stephenville ufo sightings just outside of this area to the East. 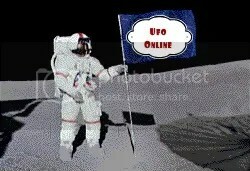 See the site http://www.nicap.org/ for many more ufo sightings, many described in detail, and an excellent site for research. This entry was posted on March 13, 2008 at 7:12 pm	and is filed under "Flying Saucer", 1947, 1952 year of the ufo, are we alone?, extraterrestials, IFO, lubbock lights, out of this world, science, ufo, ufo cover up, UFO Documents/archives, ufo in north america, ufo research, ufo's, ufo's in USA. Tagged: texas ufo triangle. You can follow any responses to this entry through the RSS 2.0 feed. You can leave a response, or trackback from your own site.